The purpose of this page is to promote the military heritage of the site in an area were men from the district actually fought as near as we can possibly achieve. 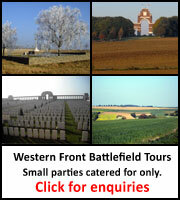 It is also to present the potential advantages of Western Front Tours to visitors of the site. With the ever continued growing interest in our military past & present, we hope that you will consider visiting the battlefields of the Western Front… i can assure you that you will return home firm in the belief that your visit was worthwhile. The whole battlefield experience is rich in the history and blood of your forefathers, it is a cultural yet awe inspiring experience, one that you will not forget. If you wish to discuss or to find out more please dont hesitate to contact us. secretarylbmhs@gmail.com 07961 582 694. 01704 892523. prior 19.00 hrs.